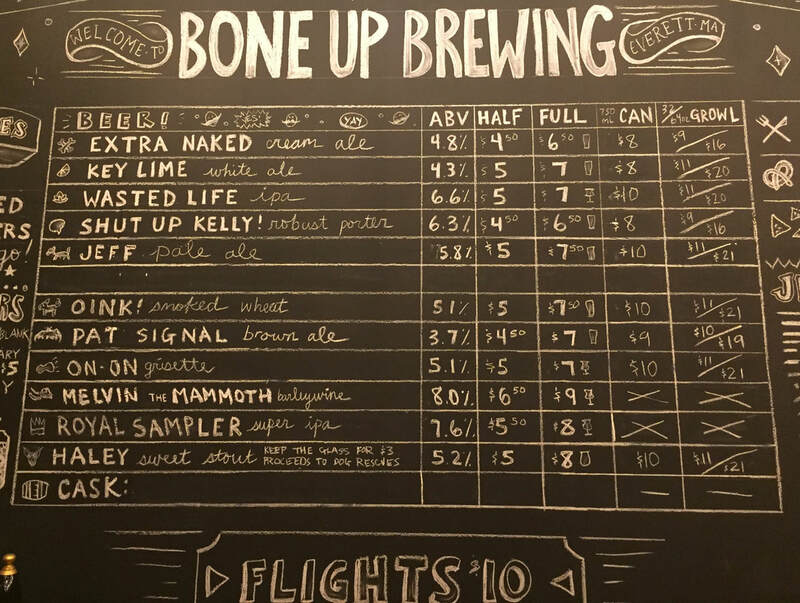 Draft List - Bone Up Brewing Co. Looking for somethin’ light-bodied that won’t let you down in the flavor department? Your quest ends here! We crossed a pre-Prohibition lager with a saison and brewed up a beer that’s light, crisp, a little hoppy, and oh so drinkable. Are you tired of fruit beers that are nothing but a glassful of disappointment? No? Oh. Well, we were, so we made a good one! Inspired by the best dessert in all the land, Key Lime is super refreshing and a little tart with notes of graham cracker. Contains lactose. Love hops? We sure do, so we crammed a completely irresponsible, wasteful load o' lupulin into this fruity, dank (yet surprisingly balanced and drinkable) masterpiece of a beer. Don't be surprised if your glass seems to empty itself over and over again. We used to work with a girl named Kelly who didn’t like dark beers until she drank this porter. Now she won’t shut up about it! This beer is comfortingly rich and smooth, reminiscent of a fine port or one of those $8 chocolate bars. Even if you don’t normally go for dark beer, you might be surprised by this one. Created to celebrate all things bacon while not actually containing any meats, this lil' guy is brewed with malts smoked over bourbon barrel staves and local wheat. Oink oink oink! PAT SIGNAL Brown Ale ABV: 3.7% Color: It’s brown! We made this lil' ol' brown ale with the NERAX cask festival in mind, and we pretty much had to name it for the biggest cask fan to grace our barstools: our friend Patrick! We just can't get enough grisette these days, so we brewed up this light 'n bright session saison with silky oats and a fistful of specialty malt, then dry hopped it with Galena for a tropical punch. We must feed the hazebeast, and the beast demands hops! A delightful punch of big ‘n fruity hop aromas is balanced by a smooth body and dry finish. Brewed in memory of a relentlessly sweet, stick-chasing German Shepherd, Haley is a sweet stout that's been rested on some oak spirals that fills it fulla dry-yet-chocolatey goodness! This is the latest addition to our Puppers Past series, and comes in a doggo glass you can keep for $3 (proceeds to local dog rescues). Cask ale is a traditional British style of serving beer; beer is naturally carbonated, drawn out by hand, and served at a slightly different temperature than draft beer to bring out flavors and aromas. Every Thursday we tap a fresh pin (keg) of this deliciousness!